While Ubisoft has had some tough times with the Assassin’s Creed franchise lately, Assassin’s Creed: Origins was just the game that the team needed to get back on track. And now, the team has decided to give the fans more of what they truly want. In a recent announcement, Ubisoft revealed that they are bringing a remaster of Assassin’s Creed Rogue in 4K for the next-gen consoles. While Rogue wasn’t the most loved games of the franchise, a lot of blame for it goes to marketing. The game was originally available for Xbox 360 and PlayStation 3, and later on, made its way to the PC. Sadly, this all happened at the time when the team was pushing the release for Assassin’s Creed Unity. While Unity was a big disaster, what’s worse is that it even took away all the limelight from Rogue. Assassin’s Creed Rogue was released for PC when the team was pushing Assassin’s Creed Unity, which took away all the attention from the former title. Assassin’s Creed Rogue tells the tale of a young settler named Shay Patrick Cormac who has just been recruited into the Colonial Brotherhood of Assassins. While the game has a frontier in sync with Assassins’ Creed III, the game shares most of its DNA with Assassin’s Creed IV: Black Flag. In fact, Rogue was the actual game that led to Ubisoft creating a full-fletched pirate based gameplay. According to Ubisoft, the team is promising “improved environment rendering, visual effects, and textures” in addition to the increased resolution. While this does mean that the game is only getting a visual update and nothing else, in all honesty, that is all the game actually needs. Also, as is the case with any remaster, Assassin’s Creed Rogue Remastered will also contain all of the original game’s downloadable content: the Master Templar and Explorer DLC packs, as well as two bonus missions, “The Armor of Sir Gunn Quest” and “The Siege of Fort de Sable”. Assassin’s Creed Rogue is scheduled for release on Xbox One and PlayStation 4 on March 20th, 2018. Personally, I feel this is a step in the right direction since Assassin’s Creed Rogue was definitely one of the nicer games in the company’s franchise. A remaster of the game will allow more players to play a game they most probably missed out on while having it up to date with a next-gen graphics overhaul. 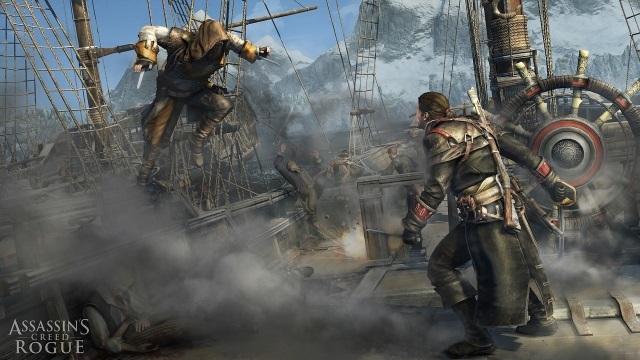 Did you play Assassin’s Creed Rogue when it was originally available on Xbox 360 and PS3? And are you excited about the remaster? Do let us know your thoughts in the comments down below.